Nintendo UK is giving Splatoon a renewed push with The Summer of Splat, a series of events which will take place between 16th July and 7th August. Each weekend throughout the event the best teams can earn a place in The Splatoon Fan Fest, a day of challenges which will take place at London's Gfinity Arena on 27th August. That's not all - from 11th July via the Splatoon Facebook page, fans will get the chance to submit Splatoon-inspired cosplay or artwork. Each week for four weeks, five of the best entries from each competition will be picked and shown off via the official Facebook page, and all entrants selected via this process will be invited to The Splatoon Fan Fest. The Fan Fest will also give fans the opportunity to snag exclusive Splatoon prizes, merchandise and even artwork created by Splatoon's Art Director and a one-off, personalised Splat Champ winner's jacket. We are delighted to be working with Nintendo on The Great British Splat-Off, giving players of all ages and levels an opportunity to experience the wonderful world of competitive gaming. We'll be putting on a fantastic live event at the Gfinity Arena & Studios in London bringing together fans and players alike! If you can't make it then worry not - The Splatoon Fan Fest will be streamed via Nintendo UK's Twitch Channel. Will you be signing up? Let us know by posting a comment. I'm done with this game. Not sure I'll even play the last Splatfest. I will, however, play the Callie and Marie Event Course in Super Mario Maker, which is now live by the way. I signed up though just in case I change my mind. Sounds good to me! Better get my arty stuff together and blitz it this weekend! What are the odds experienced players join the inkling league in order to dominate? Might actually assemble a squad for this. I would love to see Spla2n as an NX launch game. Are Splatfests ending because the number of players online are dwindling? Alright! I hope this comes to other regions as well. @Zoriam I wouldn't worry if I were you. His whole raison d'être is posting negative or otherwise nonsensical fud. @SLIGEACH_EIRE I agree. Turf War especially is so boring. Having an XB1 now, I have more than my fill of competitive online team based shooters that have helped me forget all about Splatoon, as fun as it was last year. @Zoriam Maybe it's just a really old game that we all have played to death? "-giving players of all ages and levels an opportunity to experience the wonderful world of competitive gaming-"
Not when you don't live in Britain. @Zoriam I'm bored of it after playing 100's of hours. If it had more modes, options, like choosing a level yourself rather than the limited rotation. Voice chat would be nice too. And I've never been a fan of the controls. I'd really want to take part! :3 Although ever since it became apparent that Nintendo is slowly phasing out support for Splatoon, I haven't been playing like I used to. It would be fun to watch & cosplay though! Seriously? 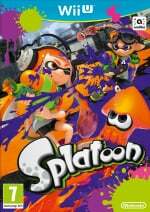 No one is asking what the connection between Subway and Splatoon is (apart from freshness being part of their slogans)? 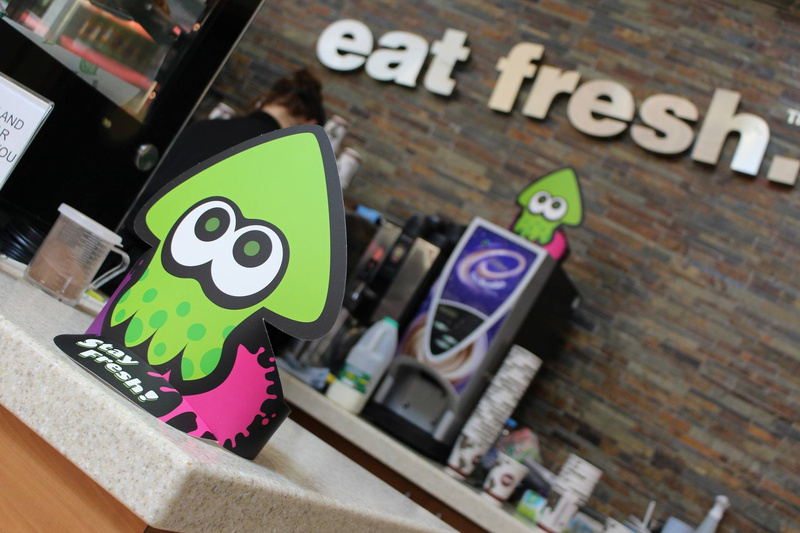 I'd like to know where this photo was taken and where Subway cooperates with Nintendo to promote Splatoon. Also, why aren't there any tournaments in other countries? Why only in the UK? Why not in the other EU countries EU? You can still make a new game out of it by changing your weapon, using different abilities than before etc. I played it for nearly 600 hours, then didn't play for 22 days until yesterday, then played it again and it was still great. I still feel like I can improve my game. And I haven't even leveled up all my gear and there are still many weapons I'm not good with. I really don't see what a different rotation would change at this point. Everyone has played every map x times, it just doesn't matter anymore. And if you need voice chat, Discord, Teamspeak, Skype, Steam or your mopbile phone provider are there for you. @gatorboi352 I don't know if the world "old" applies here, the game's hardly one year old. You wouldn't call a baby "old", would you? To be called old, a game has to be at least 10 years old or more, if you ask me. @Moon: I doubt that. Not the declining part per se, which could be true, but no one can really check that. Even if the number of players was declining, you wouldn't notice. If anything, a Splatfest would increase the number of active players. Besides, a Splatfest takes really zero effort from Nintendo, so they could do it anyway. I don't get why this is the final Splatfest though. @shani If I say something it's true. Your answers are all defensive like it's my fault I don't have voice chat because I should use the likes of Skype. Say that to Sony and Microsoft and see how long you last before getting chased out of Dodge. Nintendo should provide voice chat, no excuses. This is the perfect opportunity for Subway to release the calamari sub! @SLIGEACH_EIRE people don't believe you much on here do they!?! Does this mean we get to see more pics of your carpet? Just remember, you're not allowed to have a negative opinion, get bored of games or dislike amiibo, OK!?! @ULTRA-64 Ya, unfortunately if one says something negative about Nintendo or any of their games then it must be a lie. God forbid you grow tired of something. Sorry, no photo of the carpet this time. Here's a photo from the game log. I thought I'd played longer. I mentioned Super Mario Maker earlier. Let me take a photo, I know I've played that much longer and I love it still. That's because its possibilities are endless and it has far more depth. And I suppose I should reference @shani - " I don't believe you..."
@SLIGEACH_EIRE Technically it's not "hundreds" (plural) of hours, but, yeah, you're right, negativity isn't allowed around here. I've had plenty of negative things to say about Nintendo this past year. I wonder if we would be hated for being relentlessly neutral? If everything was OK, so so, fine or satisfactory......would that bug people as much? @ULTRA-64 Yeah, I'm going to be relentlessly neutral from now on, and see how that goes. Although I'll probably end up just being sarcastic. My biggest Nintendo sin is that I don't even like Mario games. I think the controls are poor, and they lack any originality these days. @SLIGEACH_EIRE: That's the thing, I totally disagree. No game should have voice chat integrated. It's such an annoying feature! The first thing I did when I started playing GTA Online was muting voice chat. When I was playing together with a friend, we just used Steam voice chat or the telephone. Even though you can also set the GTA vc to "friends". I just don't want it being part of the game. Integrated voice chat in video games is an abomination and I'm very glad that Nintendo don't include it in their games. And I know I'm not the only one, most people in the Splatoon thread also play without vc, I noticed it during every NL Splatournament. In general, voice chat is optional. No game definitely requires vc, even those games where vc can be beneficial. It's still optional. In fact, vc is not even beneficial for me. It's just a distraction, every time I played any game with vc, the results were worse than vc. So that's why I don't get why you and a few others are whining about the absence of integrated voice chat. If you want vc, use one of the many vc services. You demanding integrated vc is like demanding that GTA V on PC should be shipped with an Xbox 360 Controller. If anyone wants a controller, they should buy it separately, because there is also the option of mouse and keyboard and many prefer those over Gamepads. @RainbowGazelle yeah the whole Mario 2d thing feels a bit plain and bland now compared to other platform games. I got allot more out of dk:tf and Rayman in terms of sheer fun and gameplay value, they were better in every other way too TBH. The 3d ones always grab my attention but rarely have depth these days except for the endless bonus world's! I've never had a problem with the controls in a Mario game though to be fair, are they just a bit floaty for you or something? @ULTRA-64 It's because they map too many actions to one button. Y for run, and pick-up, and shoot. Plus I have to hold my thumb over 2 buttons to run and jump. The option to map run to a shoulder button, like Rayman Legends, would be very welcome.